Evaluations are done prior to the start of training lessons. In an initial “meet-and-greet” evaluation, Take the Lead is able to learn the horse and handlers’ current skills and develop a meaningful plan for future sessions. Take the Lead training lessons are perfect for the owner who wants to ‘do it yourself’. While the owner is very hands-on, we can step in if you get into trouble or need help with maneuvering or any other situation that may call for assistance. With Take the Lead training lessons on your side, you’ll be amazed at what you’ll be able to accomplish.Things such as moving your hand in a different position, or asking a little differently with cues can make all the difference. Let us show you how! 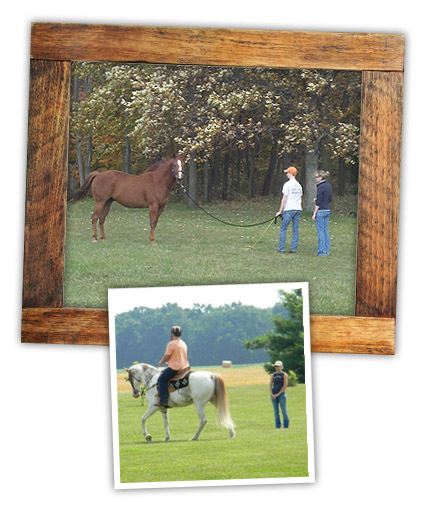 If you own horses and want assistance, but do not have the time, means or money to travel, let Take The Lead Horsemanship come to you! Note: At this time we are only able to offer local training lessons.